The giveaway has ended. Scroll down to see who won! If you're the type of person who enjoys perusing photos of beautiful paper goods while learning about the artistic techniques of designers around the world, I can pretty much guarantee the brand new book, I ♥ Stationery, will be right up your creative alley. Block printing, letterpress, calligraphy, paper cutting, hand and digital illustration, and screen printing are introduced by author Charlotte Rivers in the compact, hardback book. Terms and tools of each technique or process accompany inspiring examples of contemporary invitations, cards, notepaper, wrapping paper, calendars, journals, notebooks, and gift tags. Despite our living in the midst of the digital age - or perhaps because of it - more and more attention is being paid to unique stationery items that make it possible to communicate with a personal touch. I was sent a copy of I ♥ Stationery from Universe/Rizzoli for review purposes and the company has offered to send a copy to two lucky commenters with a U.S. or Canada mailing address. To enter, just leave a comment on this post by Sunday, February 26. Winners will be selected by a random number generator, notified, and announced here, as well as on the All Things Paper Facebook page. Credit: © I Heart Stationery by Charlotte Rivers, Universe, 2012. DellaLuna and LindaSonia were selected by random.org and they have been notified. Many thanks to all who took the time to enter. It's great to see so much enthusiasm for stationery - definite proof that communication isn't entirely digital at this point! Stay tuned for another giveaway (worldwide) coming up very soon. Definitely some inspiring images -- great giveaway! oh, yes please! that looks like a wonderful book. Thanks for the review and the contest! Awesome giveaway!!! You have inspired me a lots! It looks wonderful! Thanks for the chance to win. Oooohh! I write so many letters to my friends, this would be so useful for a lot of new ideas! Thanks for the chance to win! I love your blog! I don't have internet access at home anymore, but everytime I take my laptop to a public wifi site, your's is one of the first sites I visit. I am always inspired by your work and the artists you highlight. Thank you! This book would be welcome and the techniques used. Thank you for the possibility to win it. Lovely book! Would love to pour myself into it! This looks like a simply beautiful book. I would love, love, love to spend an afternoon exploring it. Unfortunately, I live in Sweden but, if I were to win I have both friends and family in the U.S. that the book could be shipped to and they would take care of it until I visit in June. Oh, please, please, please pick me!!! I need some new inspiration! I love paper and I love stationery so please count me in! The book looks so great! I would love to win it! Thanks so much for hosting this giveaway! Looks amazing, thanks for the giveaway! Looks like a wonderful book and I'd love to win! This looks so beautiful! Thanks for the fun giveaway! This looks like an awesome book! I'm in!!! What a great giveaway! Looks like a fantastic book! there is too much to love about this - this book looks fantastic! thanks for the giveaway, i hope things are going well! Oh, beautiful. Thanks for the opportunity to win it!! Ooo, looks lovely! Thanks for the opportunity. I have been away from working with paper for far too long, and this book looks like just what I need to get my creative juices flowing again. Seems like it will be a wonderful reference as well. Well I <3 paper and this looks like a beautiful book. Thank you for a chance to win a copy. a fabulous giveaway and since I'm an Aussie resident I'd like to gift it if I was a winner, to a U.S. address recipient. So many inspirational projects! Thank you for the giveaway. Looks like a wonderful book! leef@theriver.com I'd like to enter the contest. This looks like a really cool book! I love the picture of the coptic stitched book. Just gorgeous stitching. I would love to have this book to drool over,lol. Thanks for a chance to win it. This paper-holic would love to win a copy! It's all beautiful - especially the gift wrap. Awesome that it's 100% recycled too! Looks a fantastically, inspiring book. Thanks for sharing. It even has a maker who lives just down the road from me. I'm in! What a great giveaway - thank, Ann and I heart Stationery! What a wonderful opportunity! Thank you and thank I <3 Stationary!! Great book Ann, I would love to win this one for sure. I miss the days when ALL correspondence was handwritten & often closed with a bit of sealing wax. These are GORGEOUS & ELEGANT & I'd SO love to be entered because - shhhhhh! - don't tell, but I still often actually WRITE to people vis snail mail. THANKS!!!! This book looks very interesting. Beautiful photos! What a very wonderful giveaway! So kind! What a beautiful book! I love pretty stationery. looks awesome, thanks for the chance to win it !! Wow, lots of goodies in today's post! Your blog posts never cease to amaze me. How do you find all the goodness you share! It looks like a very neat book. Here's to hoping. 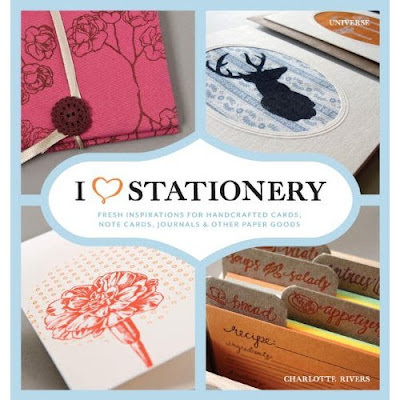 Would love a copy - i heart stationery! Thanks Ann...I am still in awe. What a wonderful book give away! This looks to be an exciting read...would love to win one. I headed over to I <3 Stationery to check out the site--looks great. Thanks for hosting the giveaway! So unique handmade stationery. love to win. Thank you. Beautiful handmade items! Thanks for the giveaway! What a beautiful post! I wish I were better at creating things like this. It's definitely an art. Hi Ann, it is always inspiring to read your blogs, you bring too many great things into my notice that i could have never noticed on my own......Thanks. On the other hand it would be really great for me to win this book as i have just migreated to Canada & it could/might be my first mail on my new canadian address.....wow !!!! I have starting calligraphy and an attempt at letterpress! I have loved stationary for years and decided to make it a career! Please put my name in the hat! Great giveaway! Ooh, I love all the inspiring ideas that book has!! Especially the calligraphy! would love to have this....count me in!!! Love the continuous postings of new ideas and improved old ones. Sure hope I win the intriguing book. Oh this looks lovely! I could use a bit of new inspiration. I think recycled gift wrap paper is a great idea. It seems silly to make new paper to wrap things when it just gets thrown away, doesn't it? Reduce, reuse, recycle! Thanks for the chance! The pictures are lovely! The butterflies especially caught my eye =) got my fingers crossed! Love the cut out butterflies. Would like to fly away with this book and spend some time within its pages. I am a stationery junkie! I bought a stack of gorgeous paper at a paper store in Cambridge, MA back when I was in college and I still have most of it (so, I guess I'm a stationery hoarder, too). I love that letterpress and other handmade stationery products are experiencing a revival. More to love! This looks like a book I'd love just for the pleasure of looking at all of the stationery goodness! Thanks for the chance to win it! I do! I do heart stationary! What a great book! This looks like such a cool book! I can think of so many fun things I want to do with the info inside! Thanks for the chance! Looks like an amazingly informative and inspirational book... Thanks for the giveaway! Looks like a great book. will be interesting to look through and get some ideas. Great pictures, a lovely book for amyone to have! definitey inspiring - thanks for the chance! I've been meaning to comment on this giveaway all week! That book looks like it has some wonderful projects. Everything looks so nice! Thanks for the giveaway! Finally got a quiet moment to try to catch up on blogs, and just in time! This book looks fantastic! Oh, my! As an avid crafter, I want this bad! Great giveaway :) Thanks for the chance! What a beautiful book full of so much inspiration!! I *love* paper goods. This would be an excellent addition to my stash of bookbinding/craft books! Looks like a really wonderful book. Loving your blog as always Ann! Would love to win, will use a US address! This giveaway has ended. Thanks so much for entering - it's wonderful to see so much enthusiasm for stationery! I would love to add the book to my collection. It looks awesome.